Bolivar Peninsular is the place to be in wintertime if you are one of the thousands of shorebirds who migrate here to feed on shrimp, fish and crabs found the shallows and low tides. The Western sandpiper is one of the most abundant shorebirds in North America. They nest in the coastal sedge-dwarf tundra of Alaska in the summer, raise their young and make the trek south in the fall. Bolivar Peninsular is one of those destinations. Amazing view in terms of numbers! This surely shows this is a good place to feed. 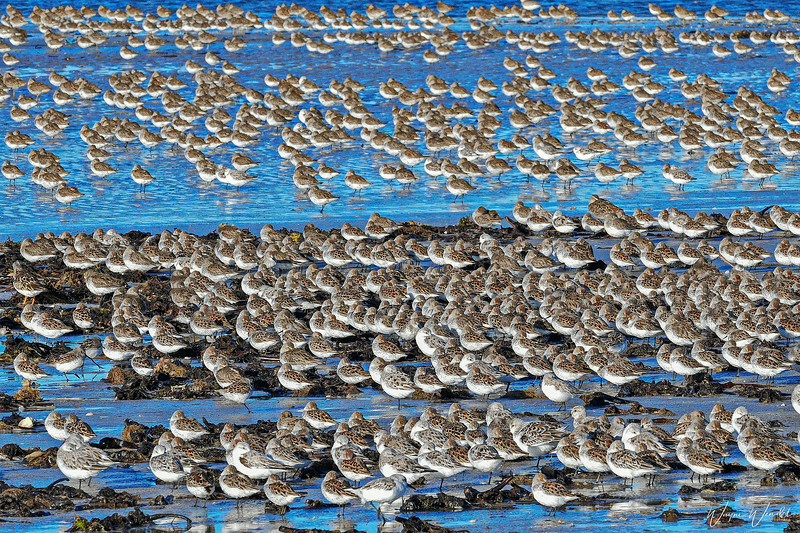 Wow, I've never seen so many sandpipers together before; great catch! Wow, what an awesome scene! I've never seen so many in one spot! A remarkable sight, and a terrific capture of it. One of the most remarkable things is that the vast majority of the sandpipers are all headed in the same direction.